While more nail polish is probably the last thing I need, I felt the urge to get into the Autumnal spirit and pick up a new wine shade. Luckily my spending spree corresponded with the release of some new Barry M Sunset Nail Paints for Autumn/Winter 2015 and the shade Vengeance is Wine quickly made it into my basket. 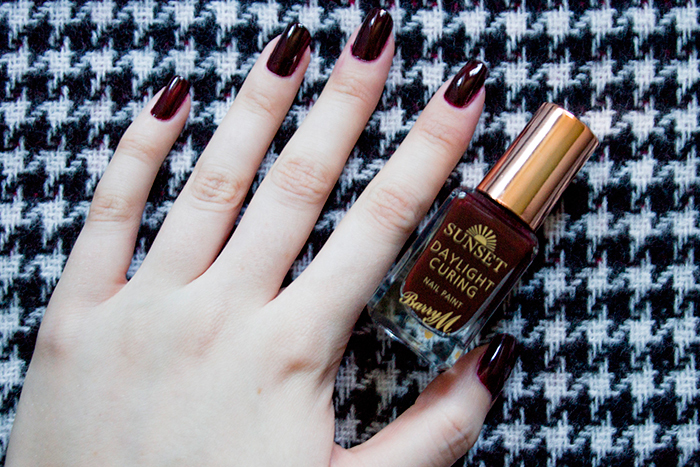 Vengeance is Wine is a gorgeous glossy wine shade, the perfect shade for Autumn. If you're not familiar with the polishes, these are basically "gel" nails without the need for UV tools as the daylight sets the polish with the help of the special daylight topcoat. Aside from the wonderful colour pay off, I can't get enough of the super glossy finish. The effect makes it almost indistinguishable against the traditional gel manicure however, the polish sadly won't last quite as long. While I got around 5-6 days wear which is pretty impressive, for the fuss I would have liked it to last a tiny bit longer. However, for the price compared to the real deal, I can't really complain. I'm sure a few more shades will be joining this one very soon in my collection.